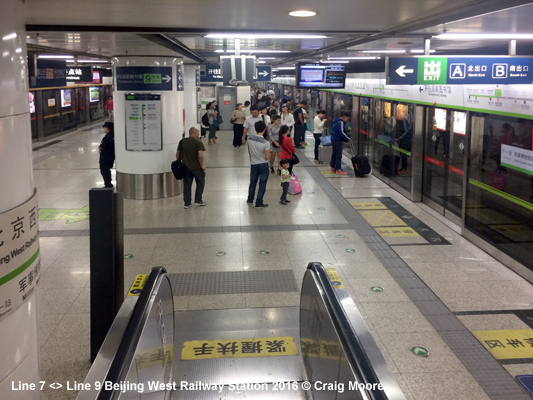 Beijing (or Peking) is the capital of the People's Republic of China and the country's second largest city (after Shanghai) with more than 12 million inhabitants in the metropolitan area (16,800 sq km). 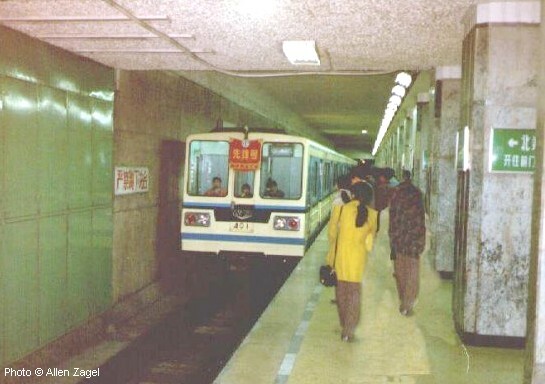 Subway construction started in China's capital in 1965. 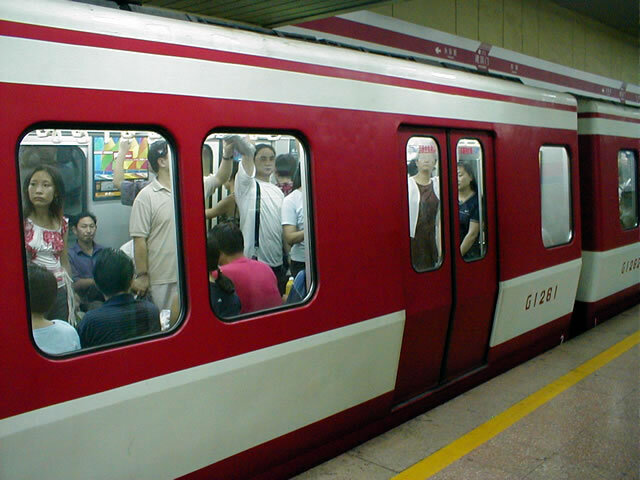 The first stretch, which opened between the city's railway station and Pingguoyuan, included today's western branch of Line 1 and the southern part of Line 2. 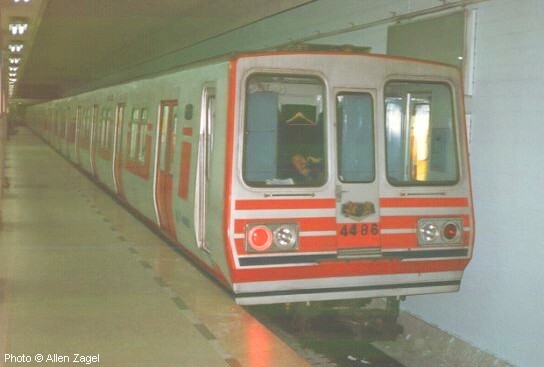 In 1987, the circular line was finished (16 km) and both lines started operating separately. 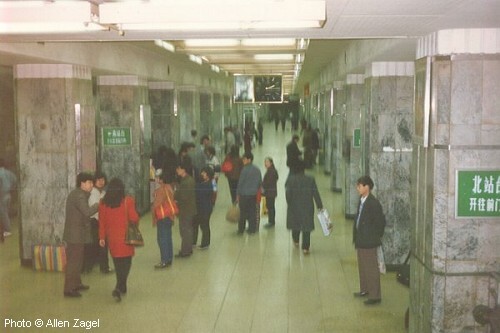 In the 1990's an eastern extension of Line 1 was built; the so-called Fu Ba Line, to Sihui East (formerly shown as BA Wang Fan) opened for trial in Oct. 1999 for the People's Republic's 50th anniversary. 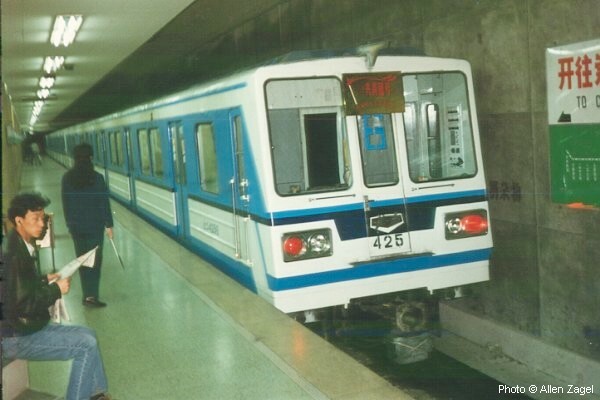 The new section (13.5 km) was eventually connected to the western section of Line 1 on 24 June 2000 which had been upgraded to ATO operation. 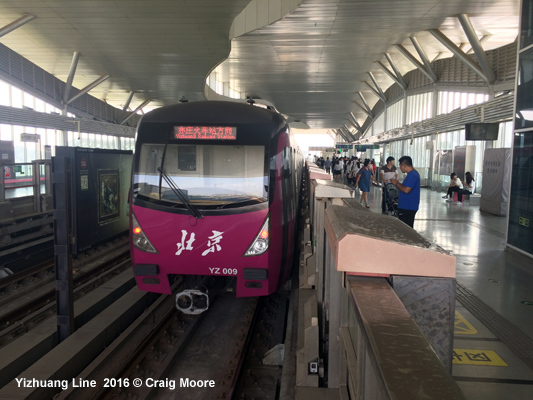 The entire Line 1 from Pingguoyuan to Sihuidong is now 38 km long and provides transfer to Ring Line 2 twice, at Fuxingmen and at Jianguomen. 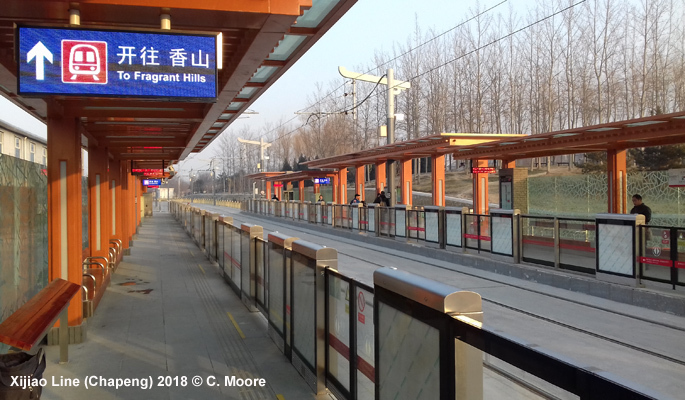 Although planned to open for the Olympics in 2008, Line 4 (28.6 km with 24 stations), which provides a metro link to the new Beijing South Railway Station, only opened in Sept 2009. 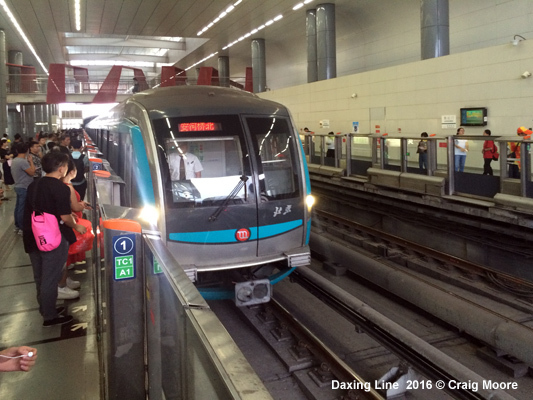 Some trains continue directly south onto the Daxing Line. 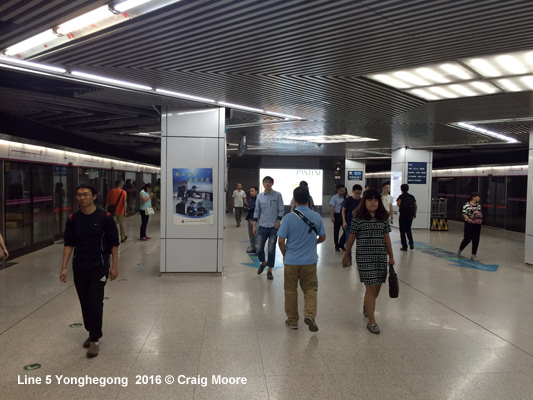 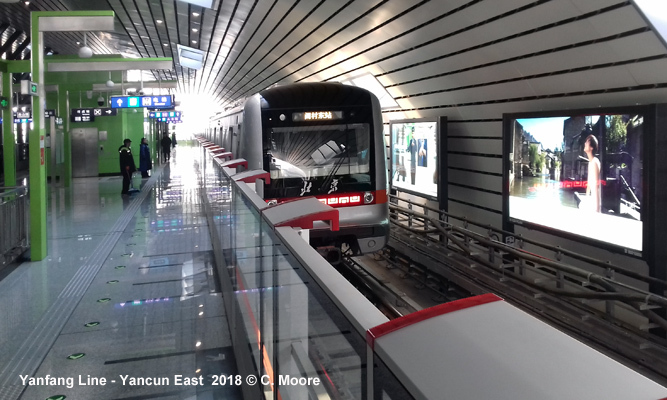 Subway Line 5, the first north-south metro line in Beijing, is 27.6-km, with 16.9 km and 16 stations underground and 10.7 km and 7 stations above ground. 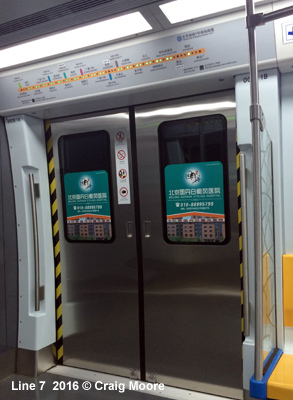 Platforms are equipped with half-high platform screen doors. 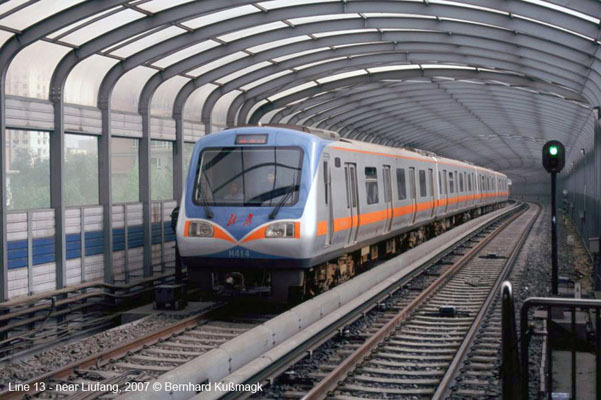 Construction started in Dec. 2002, and the entire line was brought into service in October 2007. 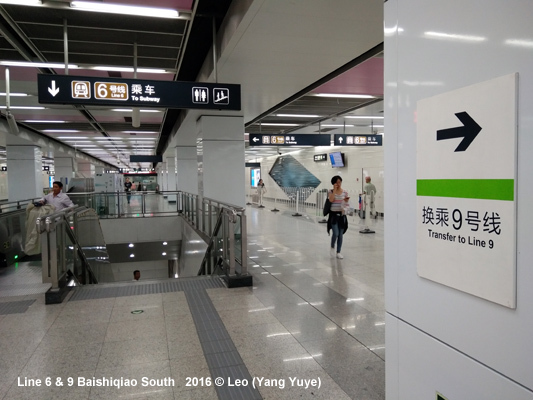 The first 4.5 km section of Line 8, the so-called Olympic Branch Line, opened on 19 July 2008. 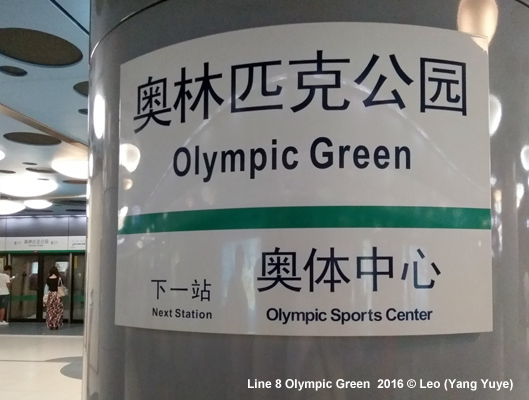 It serves all the important Olympic venues and was initially only linked to Line 10. 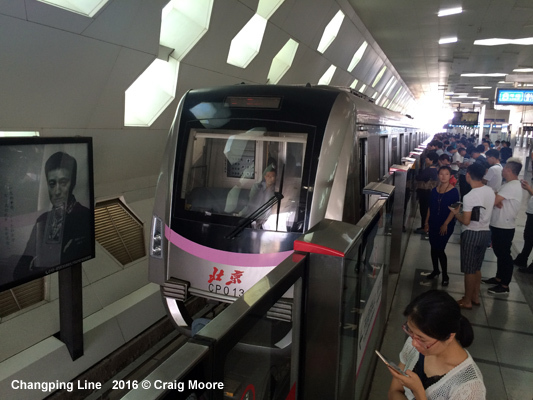 Now operating as two separate lines until the middle section is completed around 2020. 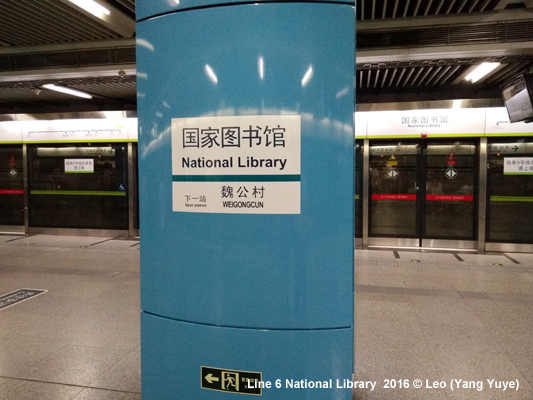 Line 9 connects National Library station on Line 4 to Guogongzhuang via Beijing West Railway Station. 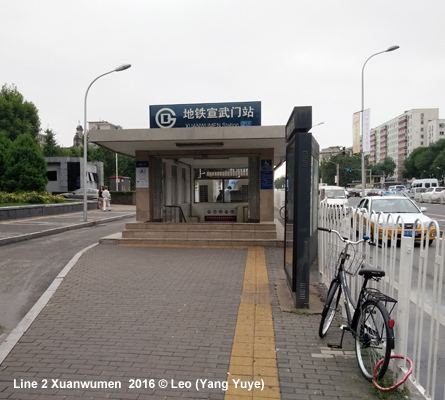 At the southern end it is linked to the Fangshan Line. 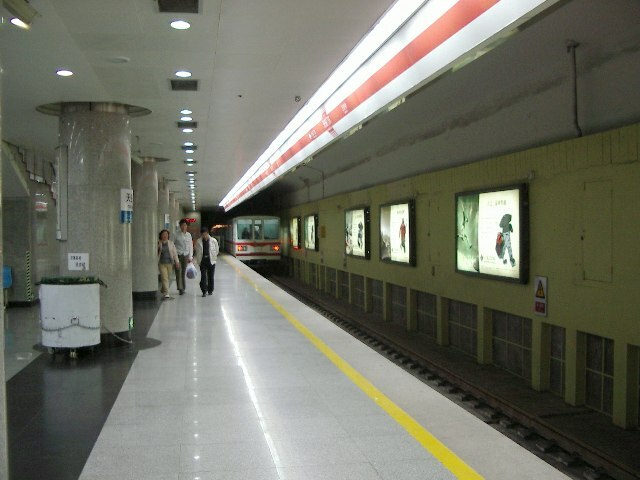 Subway Line 10 was opened on 19 July 2008, in time for the Olympic Games. Its construction had started in Dec. 2003. 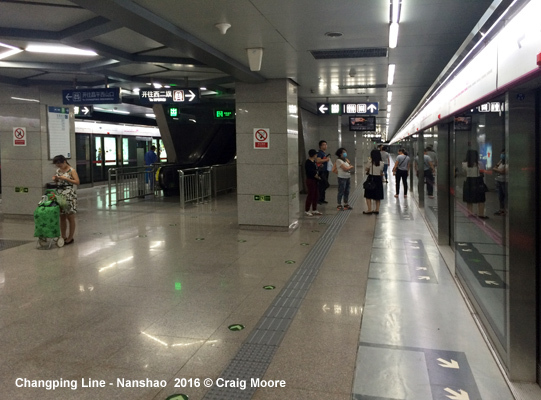 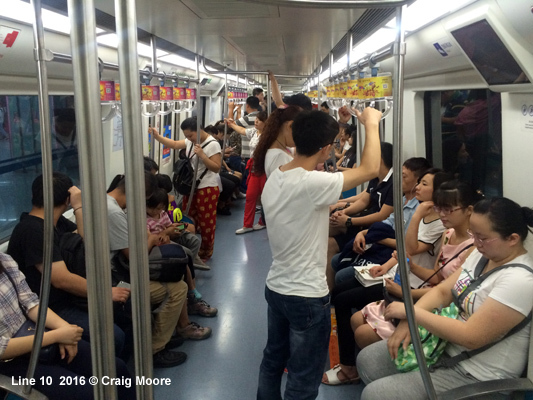 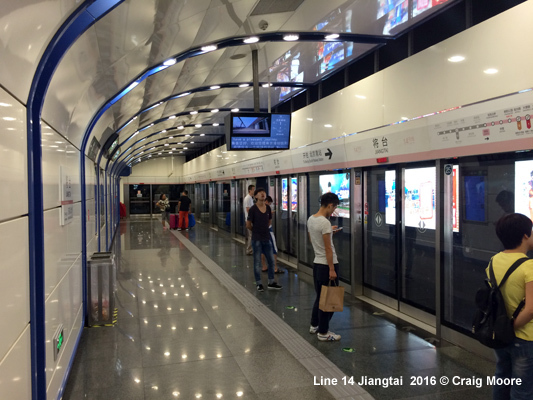 Line 10, the city's second circular line, is 54.8 km long and fully underground. 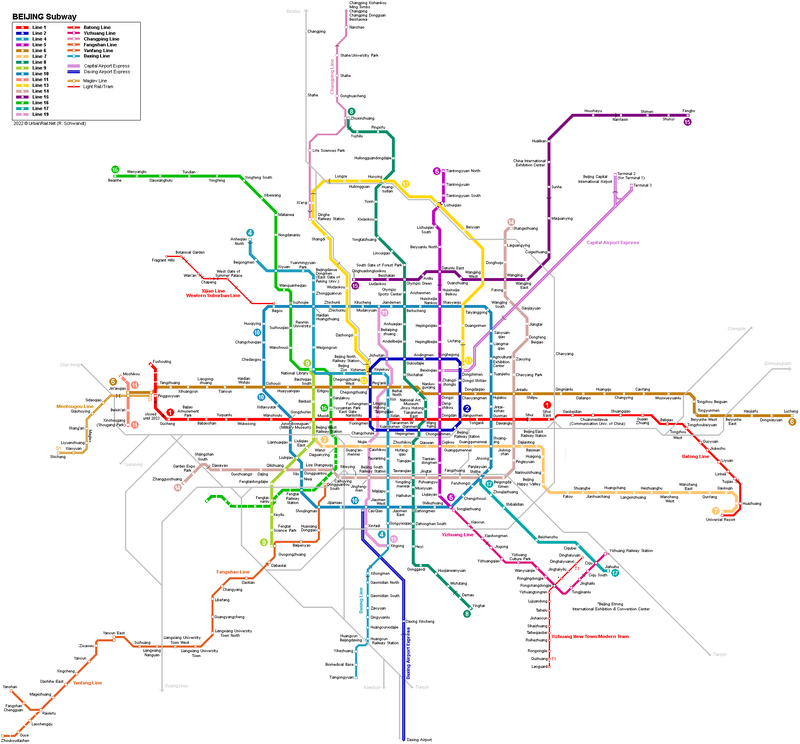 Construction of "CityRail" (Line 13 in the overall "rapid transit" planning) started in December 1999. 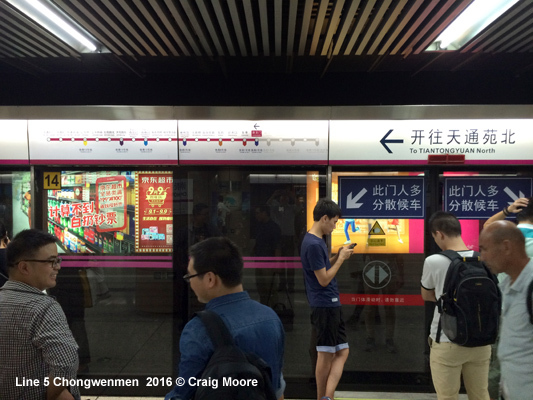 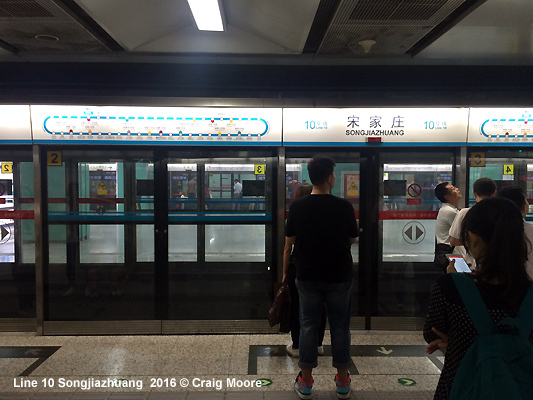 The semicircular line with 16 stations runs from Xizhimen to Dongzhimen (both are stations on the circle Line 2). 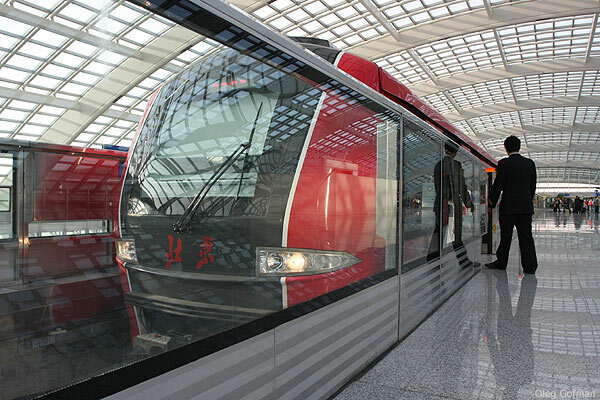 The 40.8 km line is mainly above ground, either elevated (7.7 km) or at grade (30.3km). 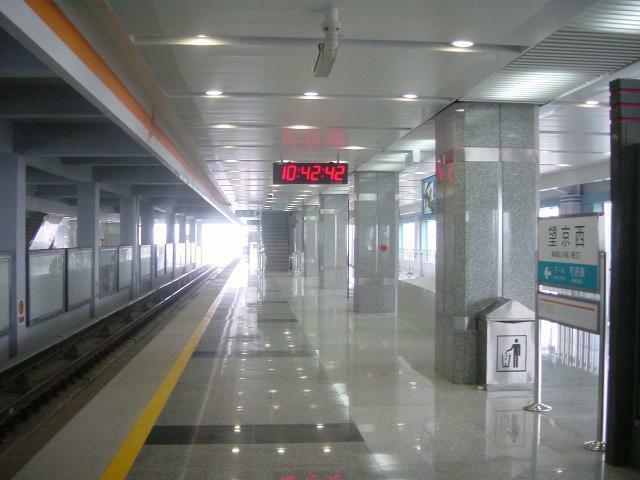 After the western section (20.6km) went into operation on 28 Sept. 2002, the eastern section was opened in January 2003. 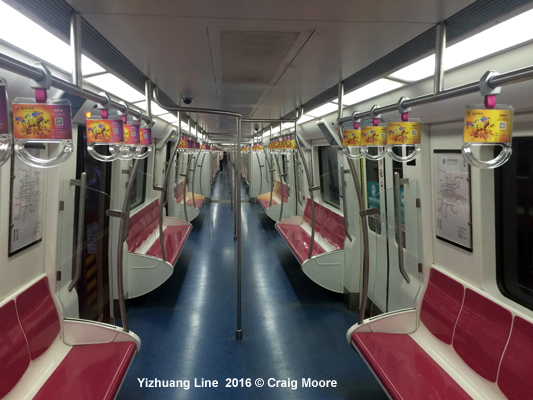 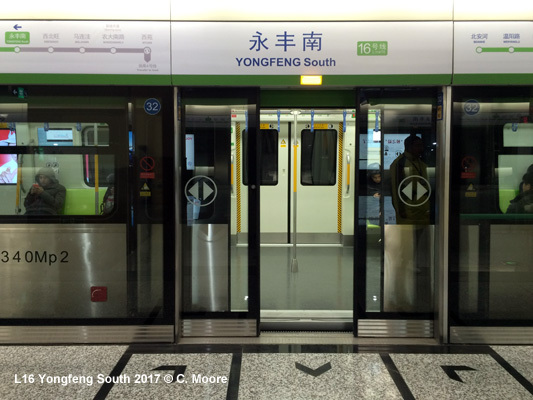 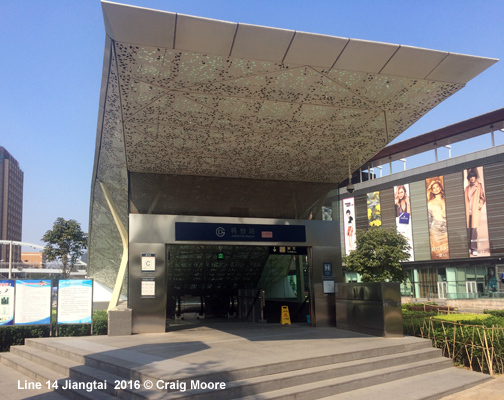 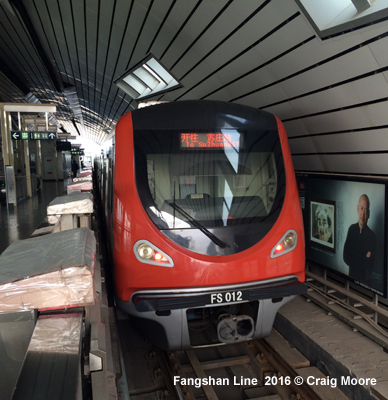 In time for the "Ninth China International Garden Expo", the western section of line 14 opened in spring 2013. 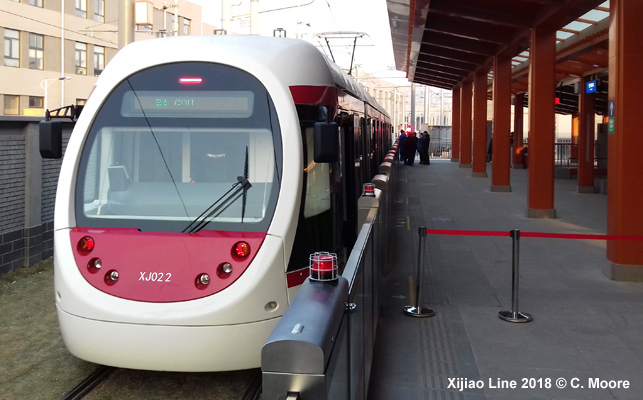 The 21.7 km Daxing Line is connected directly to Subway Line 4, with metro trains running through on the mostly underground suburban route. 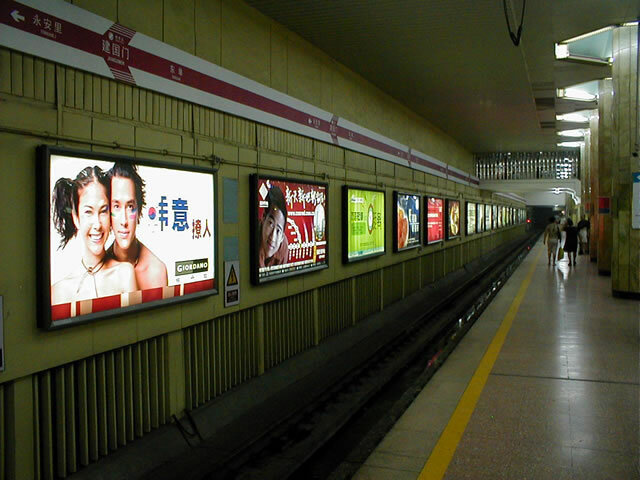 Until metro line 9 was opened, the Fangshan Line was not directly linked to the existing subway network. 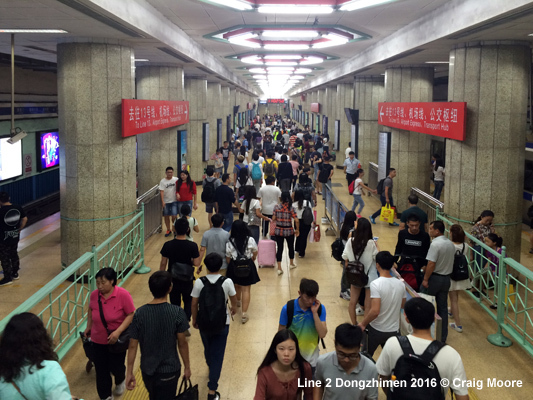 The line is 25.8 km long. 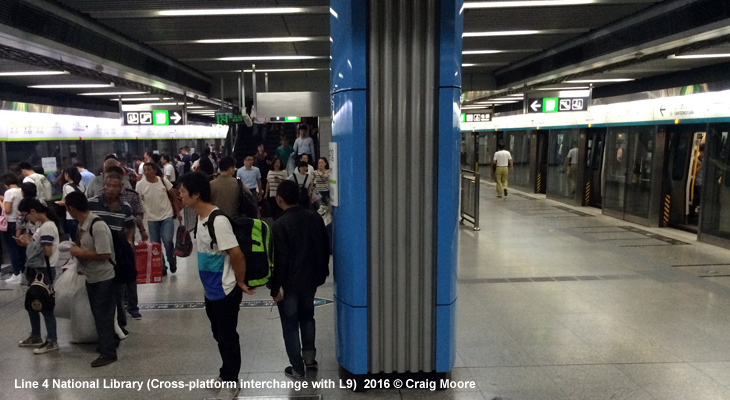 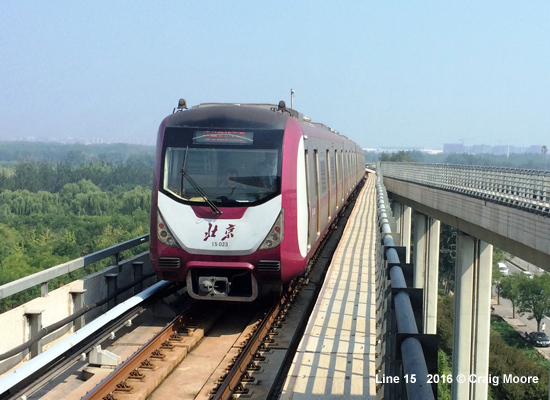 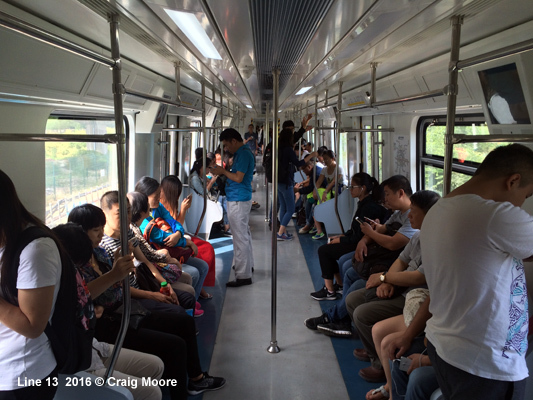 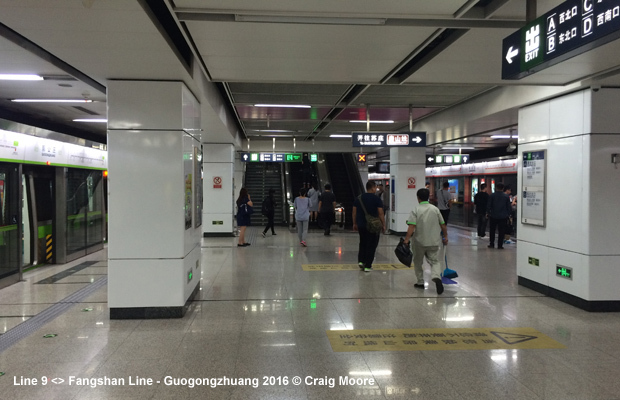 The 23 km Yizhuang Line is a logical extension to metro line 5, but operated separately. 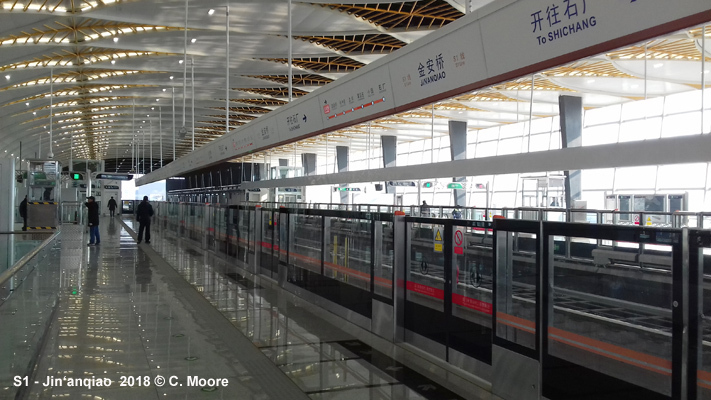 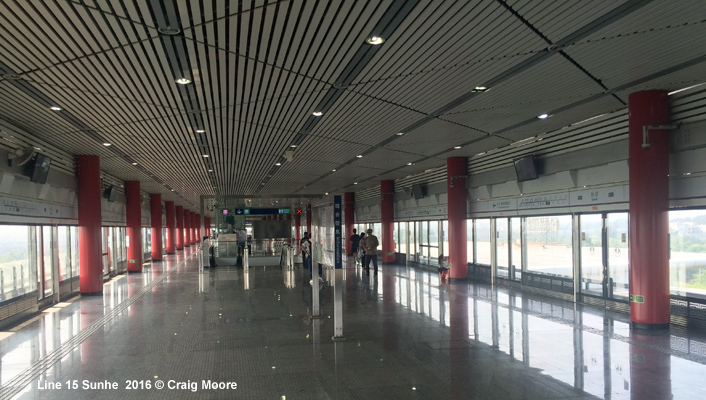 Right in time for the Olympic Games 2008, the Airport Express line (28.1 km) opened on 19 July 2008, linking the city centre to the International Airport northeast of Beijing. 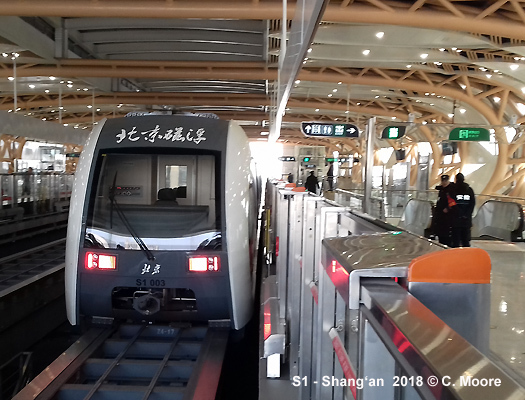 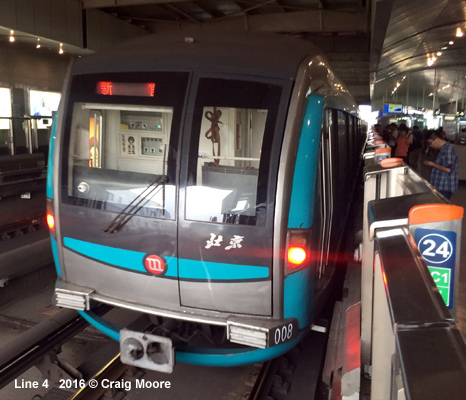 The Airport Express is a fully automatic, driverless railway, which provides interchange with subway lines 2, 10 and 13. 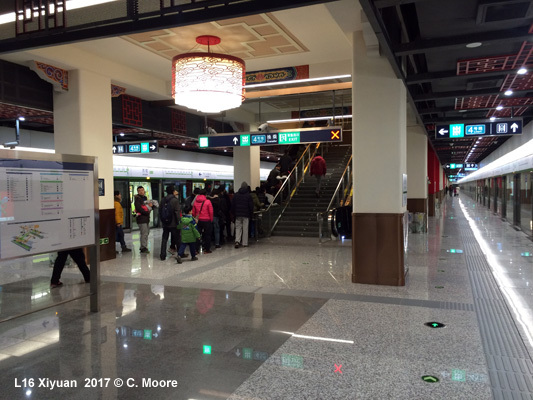 At the airport it stops at Terminal 3 and at Terminal 2 (this stop is for Terminal 1, too). 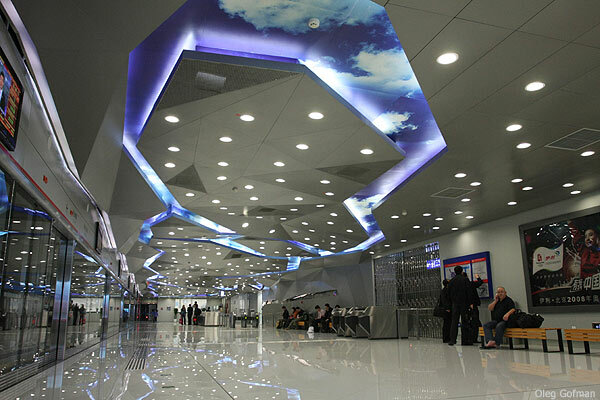 A special fare is applicable for the Airport Express. 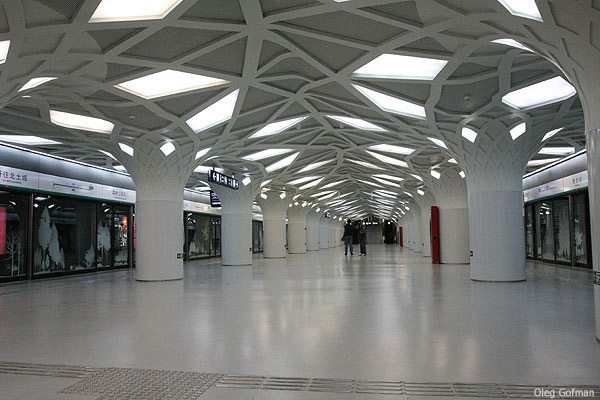 As for Line 16 - The stations are very impressive. 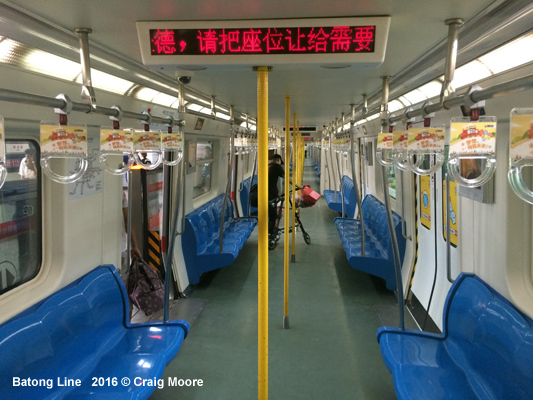 High ceilings with traditional Chinese decorative styles and colours, interesting lighting (chandeliers/wall lights etc) and all lovely and clean as you would expect from a 48 hour old line. 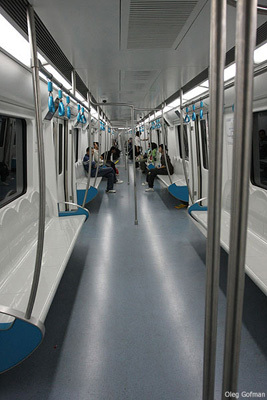 All have island platforms and full screens and the usual platform trimmings. 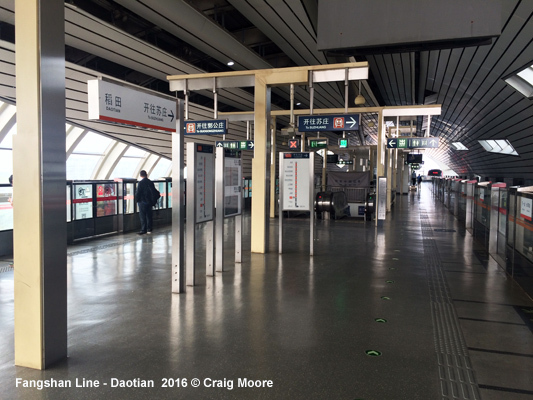 There is lots of staff around to guide people down the long wide connector corridor between L4/16 and to help on platforms and ticket halls, moreover, across the entire network, all station maps, ticket machines, and hand out maps are up to date with the new line, although there is no specific information on the line itself. 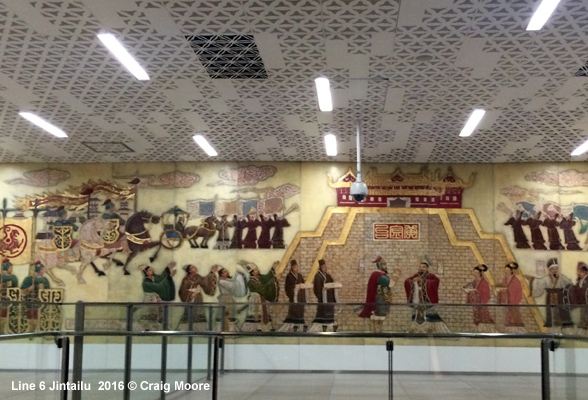 There must have been an army of people working on this leading to the opening. 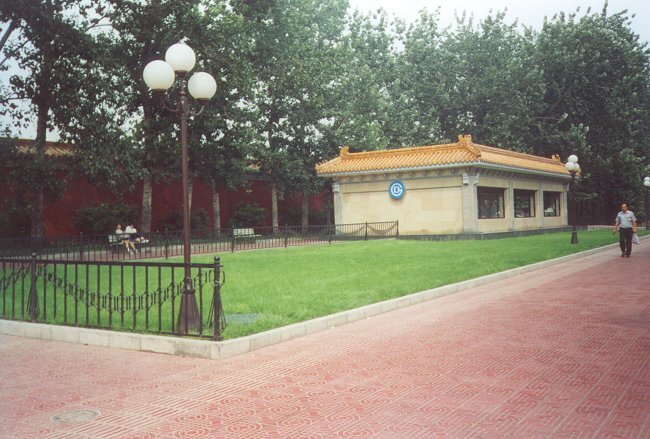 But it is also disappointing in some regards. 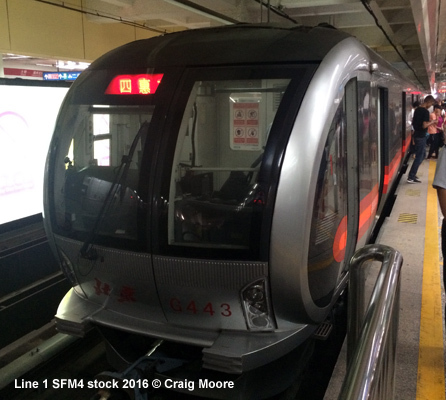 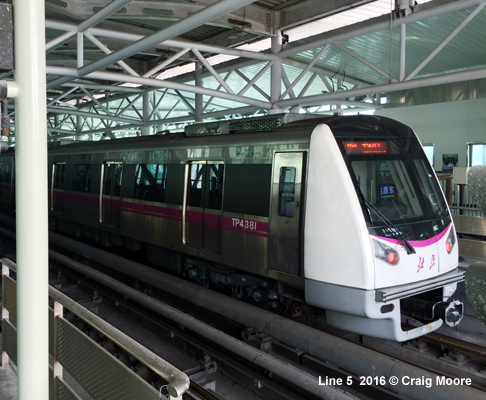 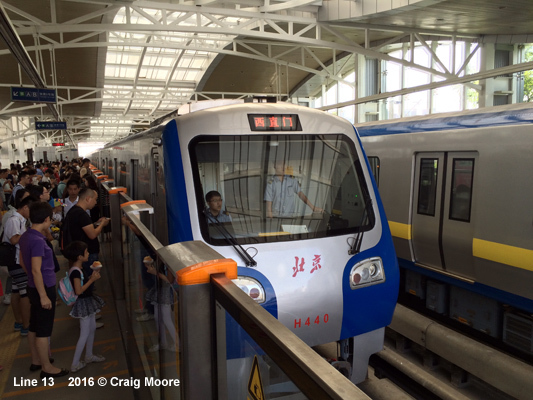 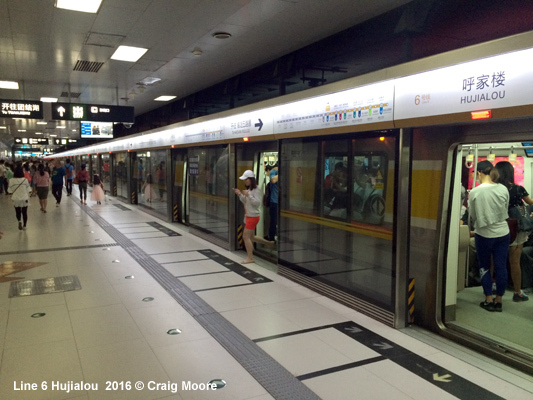 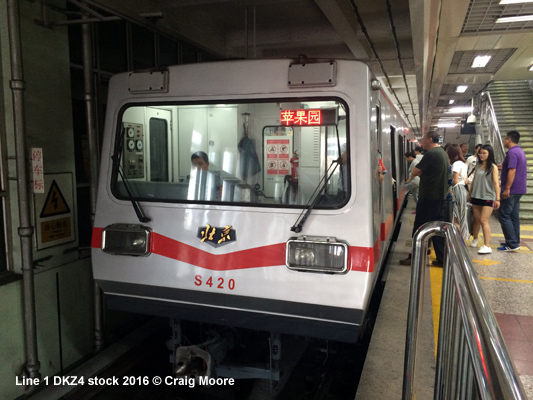 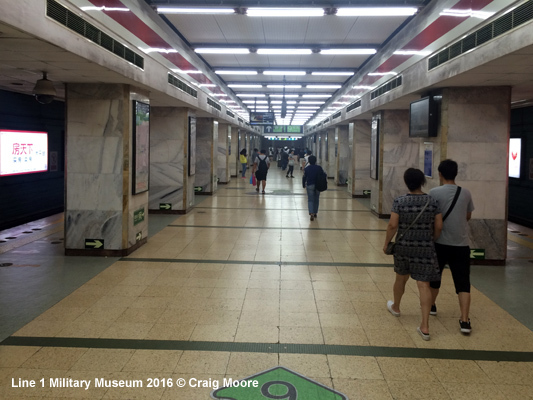 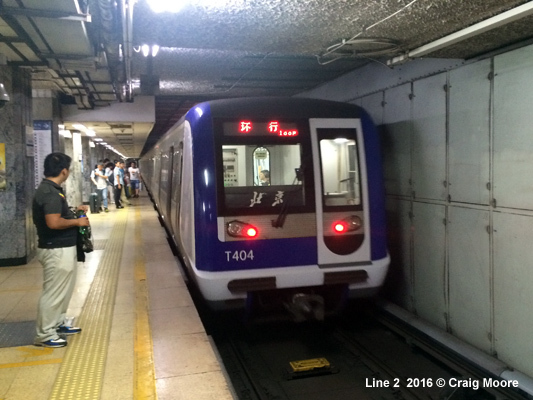 The headhouses are pretty bland, and the new stock is quite plain (as one of the four HK MTR managed lines this basic-ness seems to be a trend! 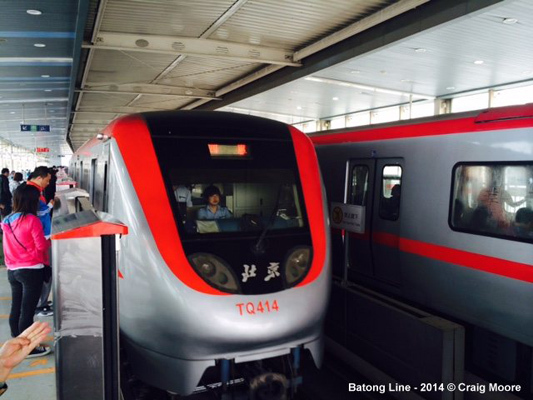 ).The 8 car stock is branded with the new CRRC logo (CNR and CSR merged in 2015 but this is the first CRRC labelling Ive seen) but there really is nothing stylish or different about it, unlike some of the new stock on other lines in China – that is the ‘uniformity policy’ of the Beijing strategy influencing things. 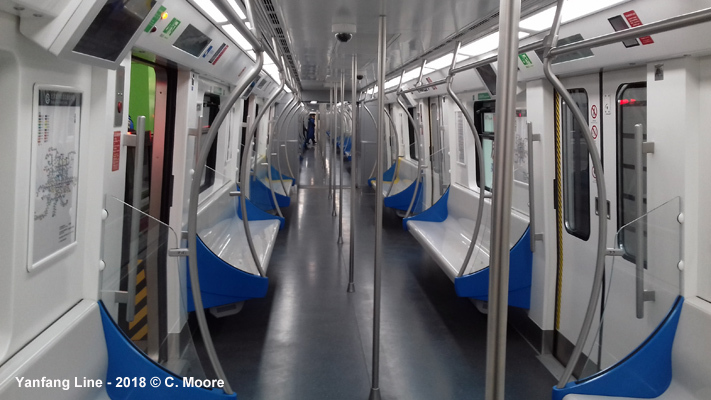 There is side seating with some banks of seats missing to allow more standing space for the planned heavy crush loads once the southern extension is completed. 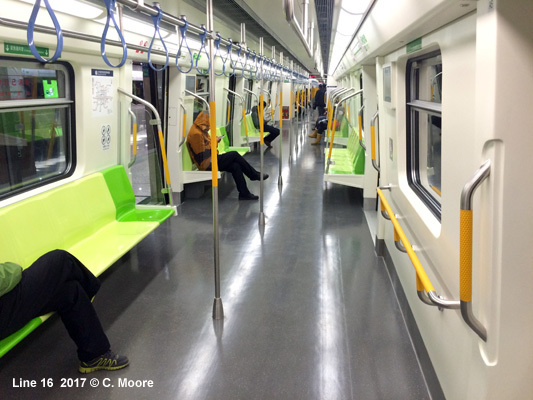 The interior is bright and shiny but oh so very cold – in fact there were teams of staff checking for draughts around the doors – I suppose one can expect teething problems. 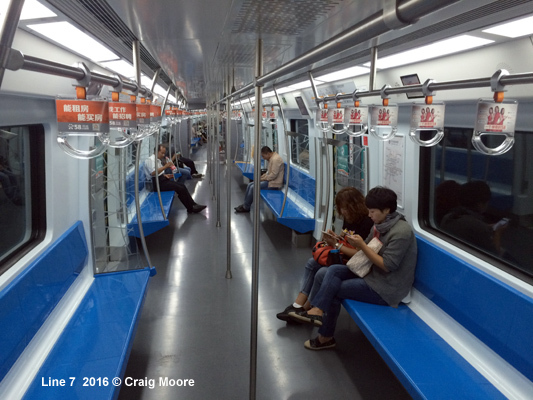 The journey is slow and the dwell times are ridiculously long. 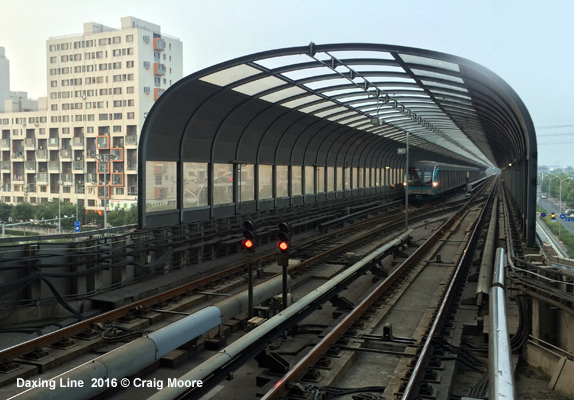 So good and bad in equal measure.